I love food that give me a nostalgic and warm feeling. A feeling of great satisfaction. That feeling is exactly what shawarma gives me. Shawarma is no doubt, my comfort food. Being born and bred in the shawarma nation, Dubai, half my life i have eaten and loved this street food. I usually make homemade shawarma wrap with pita bread during Ramadan for iftar. But this time i wanted to make something different. 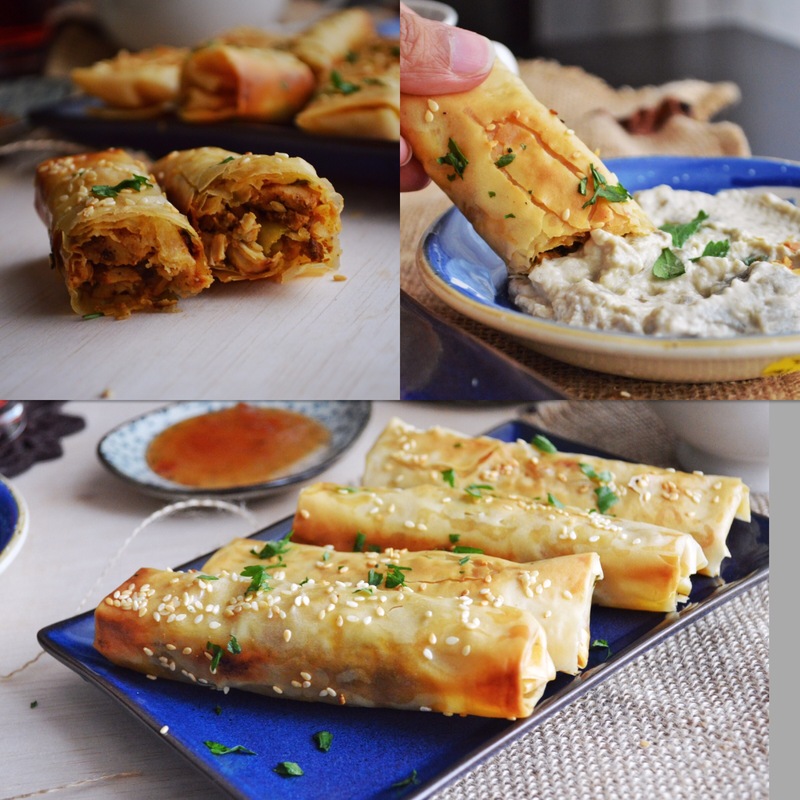 So i came up with this idea of rolling the shawarma in filo roll and baking them. I tried it and it was really really good. The best part is that you dont have to deep fry it. Even though it is baked, the rolls are super crispy and crunchy. 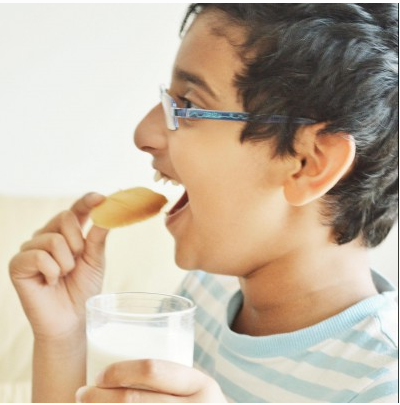 These are perfect as a snack for iftar and also to entertain guests during parties. Im sure both kids and adults will love it. Try it. 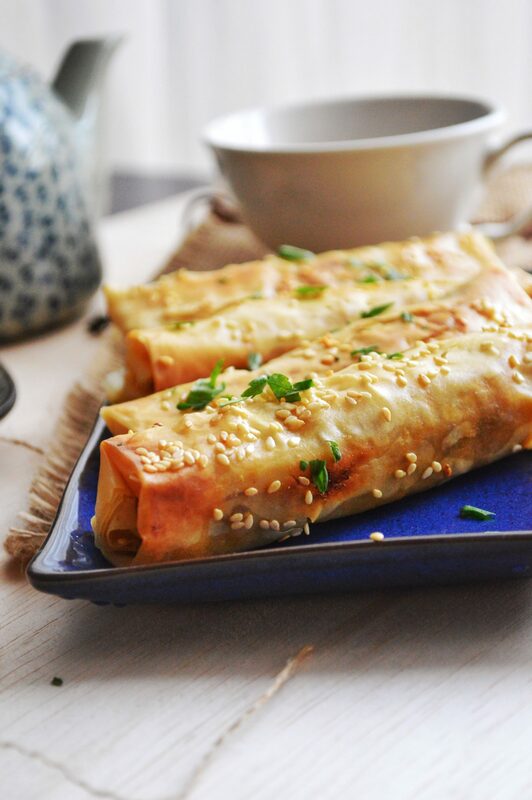 ✔️ If filo pastry is not available, you can use spring roll pastry instead. But with that deep frying will be better. ✔️ Always while assembling cover the remaining filo pastry with a damp cloth once opened to avoid drying out. ✔️ You can add mozzarella, or moutabel too in the rolls if you like. ✔️ The amount of hot sauce added can be adjusted according to your preferred level of spiciness. 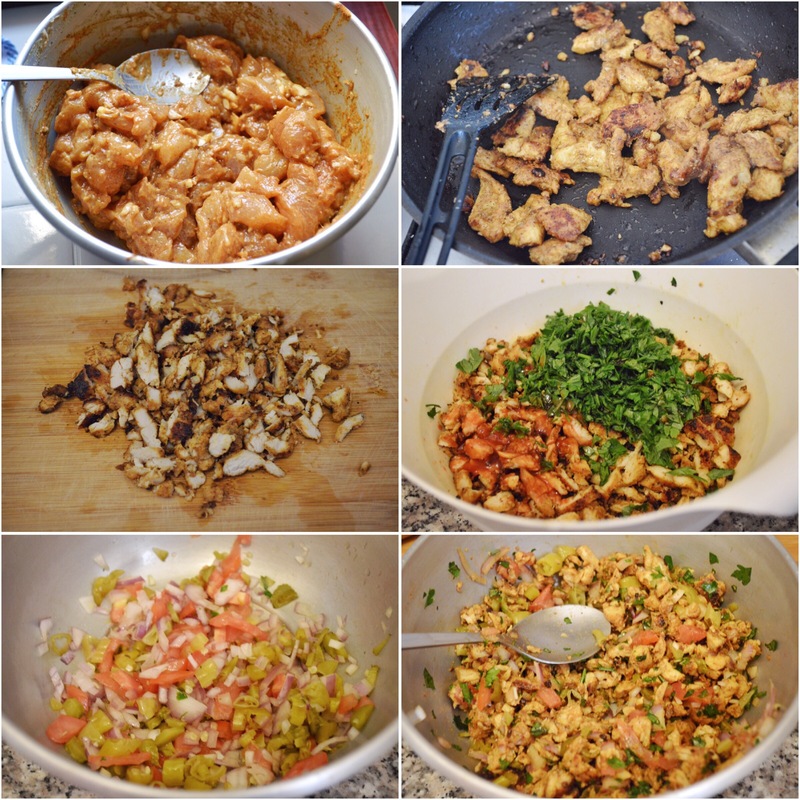 Marinate the chicken pieces in the above mentioned ingredients and let rest for 1-2 hours. Heat some olive oil in a pan and shallow fry the chicken pieces till nicely cooked and gets that char on the pieces. Chop these chicken pieces further. To the chicken, mix in chopped parsley, hot sauce and olive oil to make it moist. In a bowl mix in chopped onions, tomatoes, and pickled veggies. Combine the chicken mix in this. Your shawarma mix is ready. 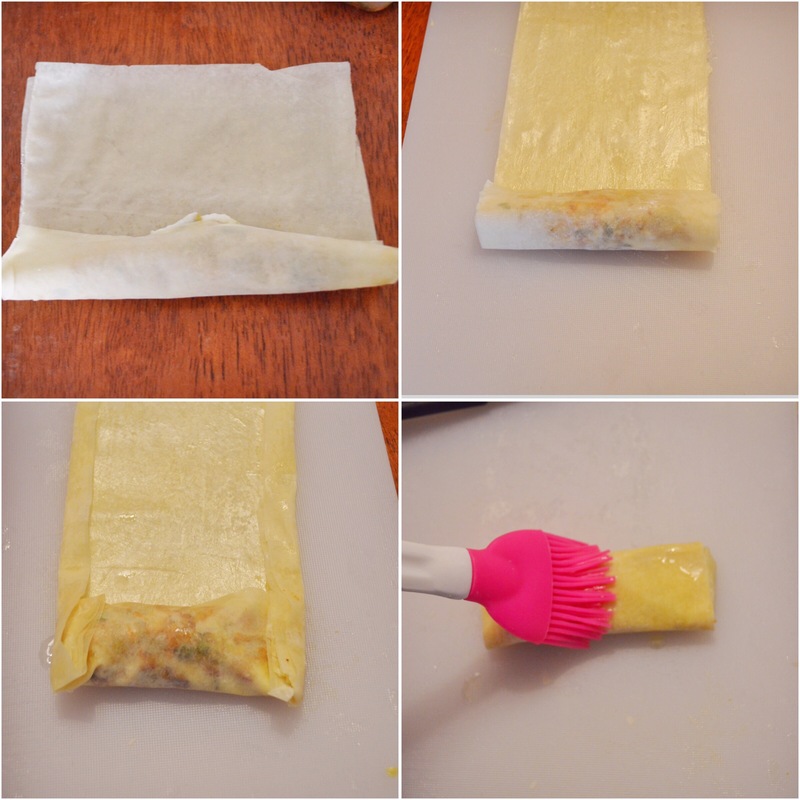 Defrost and thaw the filo pastry well without taking it out of the package. Open the package and take out a sheet of filo. Place on a surface and brush melted butter all over it. Place a second sheet of filo on top of this and again brush with butter all over. I forgot to take the picture of these two steps. Cut into 6 rectangles as shown in the picture. Take out one rectangle piece and place the shawarma mix on one end. Add in a little bit of garlic sauce. If you want you can add mozzarella too. Roll twice and then fold the sides and continue rolling. You can brush more butter on the sides and edges for it to stick well. Brush butter all over the roll and then sprinkle some sesame seeds. Place the rolls on a lined baking sheet and bake them for 25-30 minutes till golden and crispy. 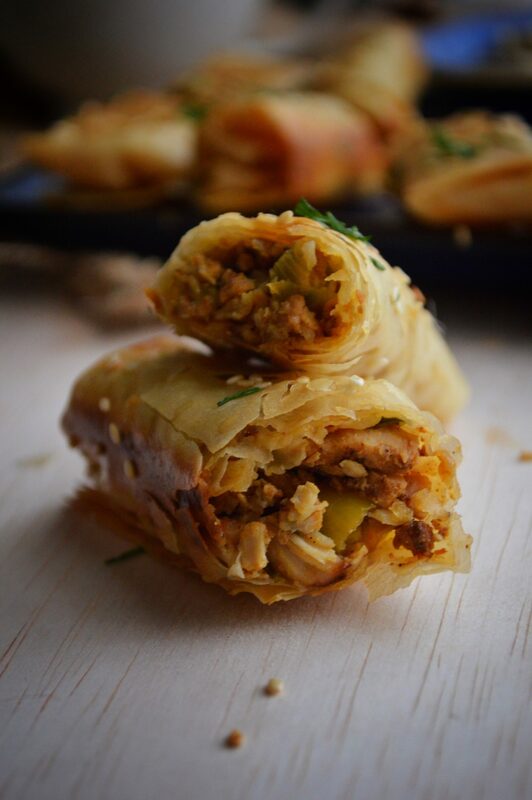 Chicken shawarma filled inside filo pastry and baked. 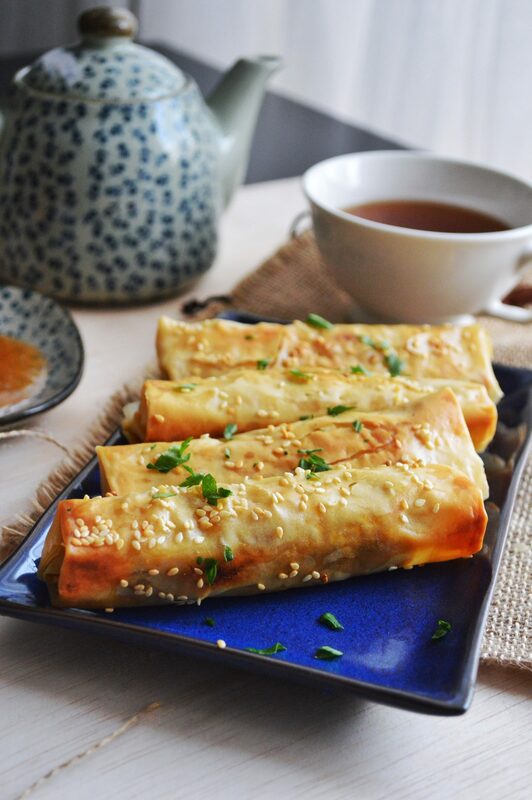 * If filo pastry is not available, you can use spring roll pastry instead. But with that deep frying will be better. 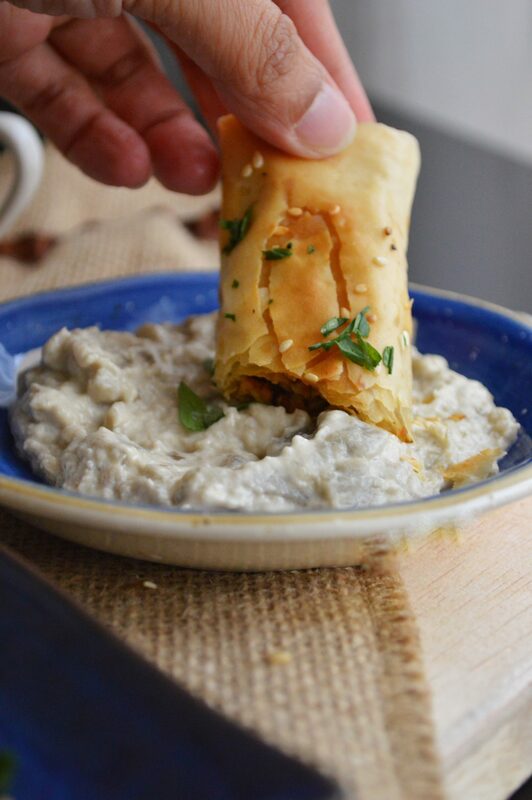 * Always while assembling cover the remaining filo pastry with a damp cloth once opened to avoid drying out. * You can add mozzarella, or moutabel too in the rolls if you like. * The amount of hot sauce added can be adjusted according to your preferred level of spiciness. Pics are amazing, am sure the dish too!! 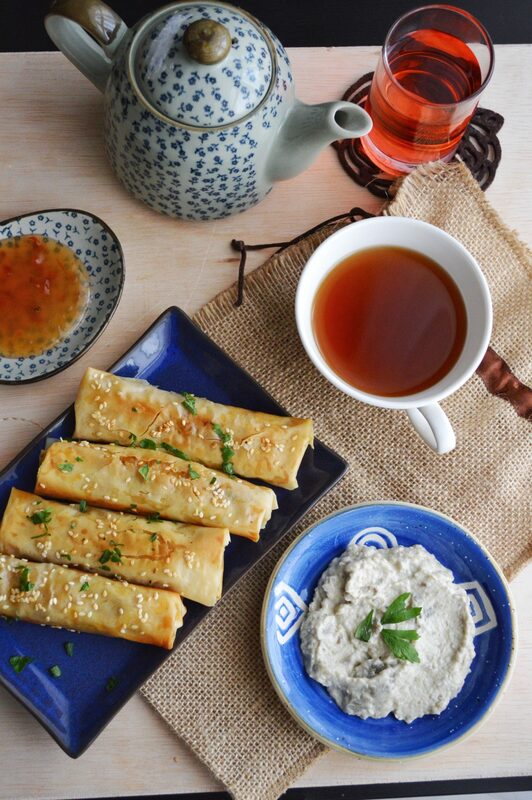 Everything you make is just amazing, those filo rolls look so good. Yeah! Where do you stay now? I’m in the UK. Where are you? I thought so, I remember you saying that before. Are you all okay? Is everything safe where you are? This looks really good. I would like to make it tomorrow. You mentioned that 4 sheets of filo pastry are required, but you mentioned putting one on top of the other. Thatmea s it’s just two? Secondly, can these be made ahead and then frozen for use at a later time? 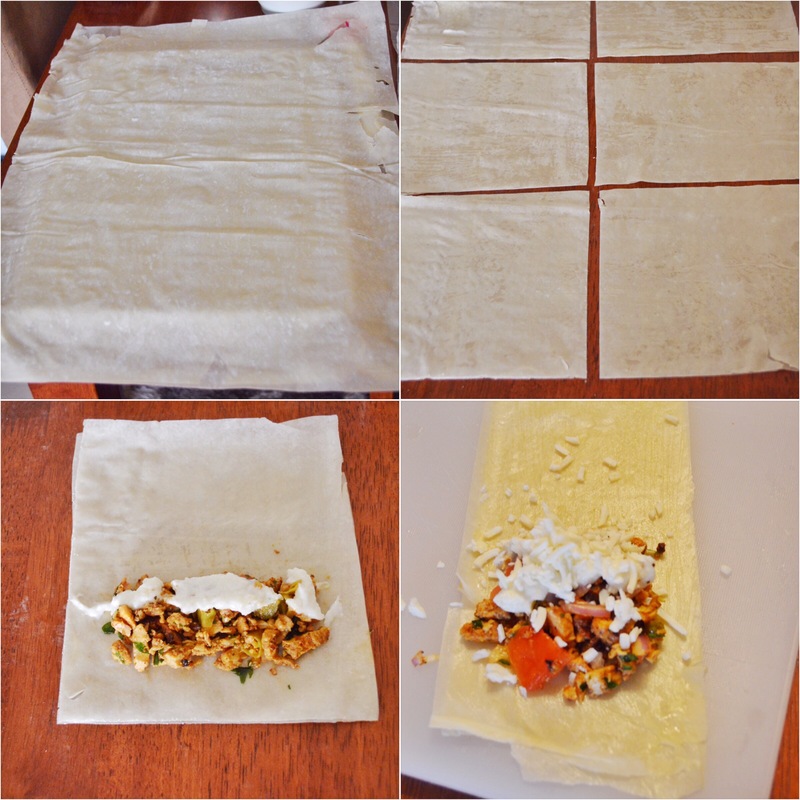 Four sheets of filo pastry will be enough for the entire chicken filling. 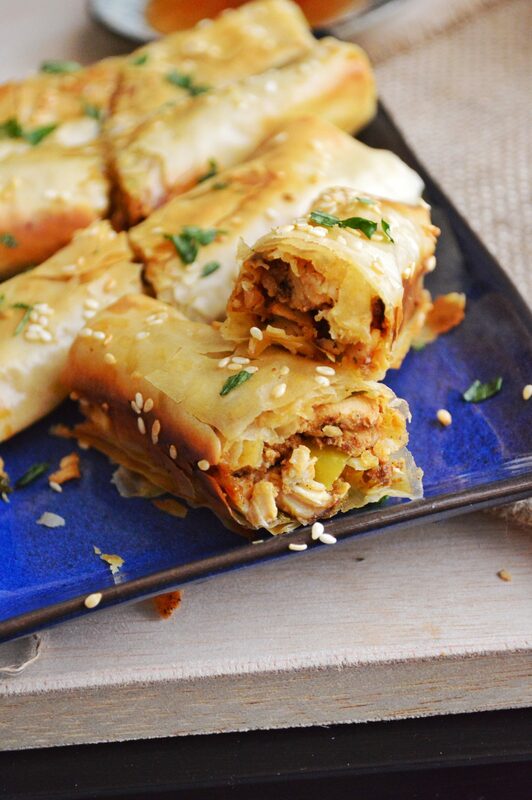 But for each roll two sheets of filo will be needed. Yes, you can assemble and freeze for later use. Could I make the same with mutton?